I have a similar loadcell with the colors as Blue-Red-Black, (instead of White-Red-Black as above, or the Red-White-Black in your image) with my red sensing wire in the middle. The positive strain resistance (increasing resistance with increasing load) is between the Blue and Red, while the negative strain (decreasing resistance with decreasing load) is between the Red and the Black. The ~1000 ohm resistance in each leg changes by tenths of an ohm with hand pressure on the button, when the outer portion is supported, but the inner portion is not supported. Your cells do not have the bridge-button part that create a balanced twist along the center portion, so it might be hard to reliably apply a load your cell. 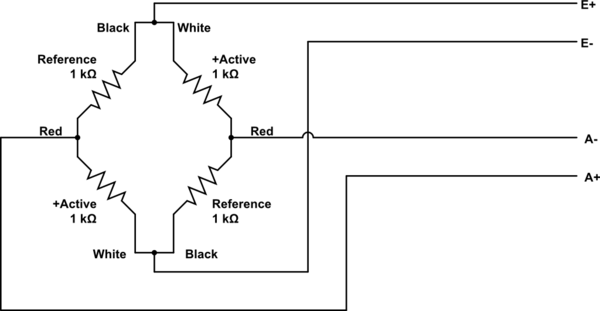 The labelling on the schematic isn't quite right-- the "Reference 1K" are actually the negative-strain portions of the cells, and might be better labelled as "-Active 1k Ohm". If it moves in the wrong direction/wrong sign with increasing force, switch the reds or multiply by -1. 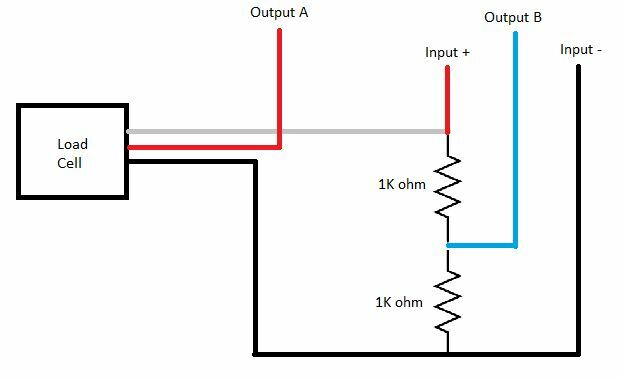 If you have only one three-wire cell, use a couple 1K resistors, or a 2K potentiometer to balance the existing cell as the other half of the Wheatstone bridge. One issue with using discrete (10%, 5%, 1%?) resistors is that the precision and tolerances when configured as a voltage divider may produce a significantly different result as compared with the balance in a lead cell and its full-scale signal (+/-0.1%) in a loadcell. 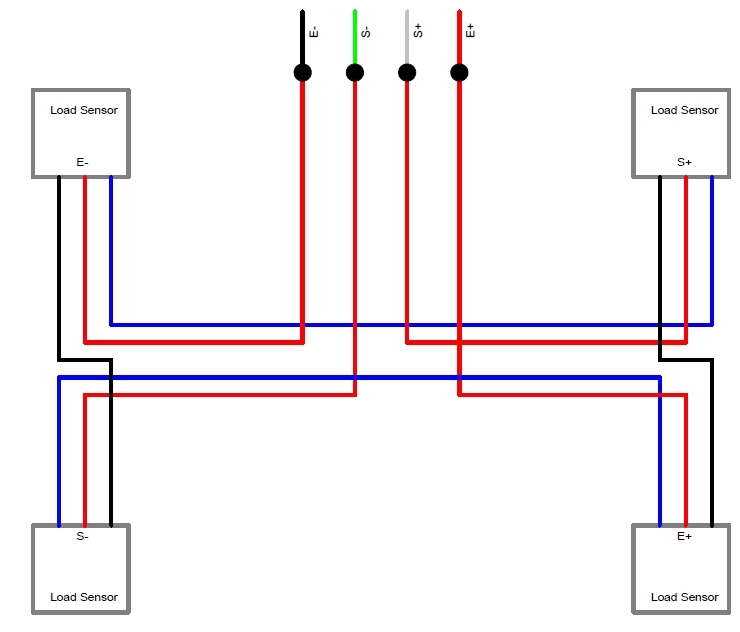 A the center tap of a potentiometer can provide for tuning to match the load cell voltage. Per @wirewrap's comment, the colors on the wire could be different than the picture I posted. 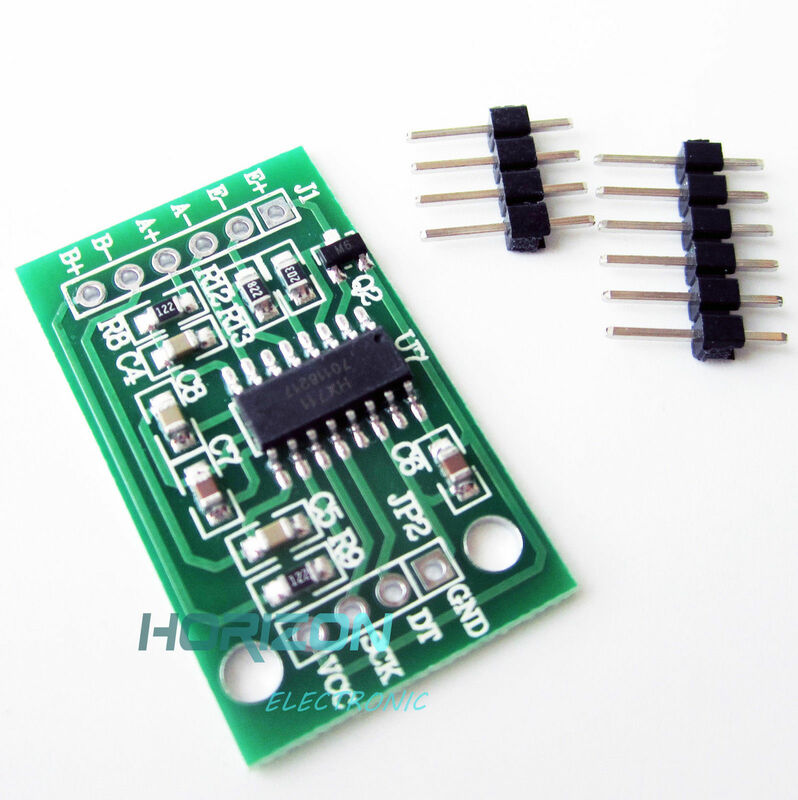 You can make certain by measuring the resistances between the wires and exciting on the pair with the greatest resistance, and sensing on the middle terminal. 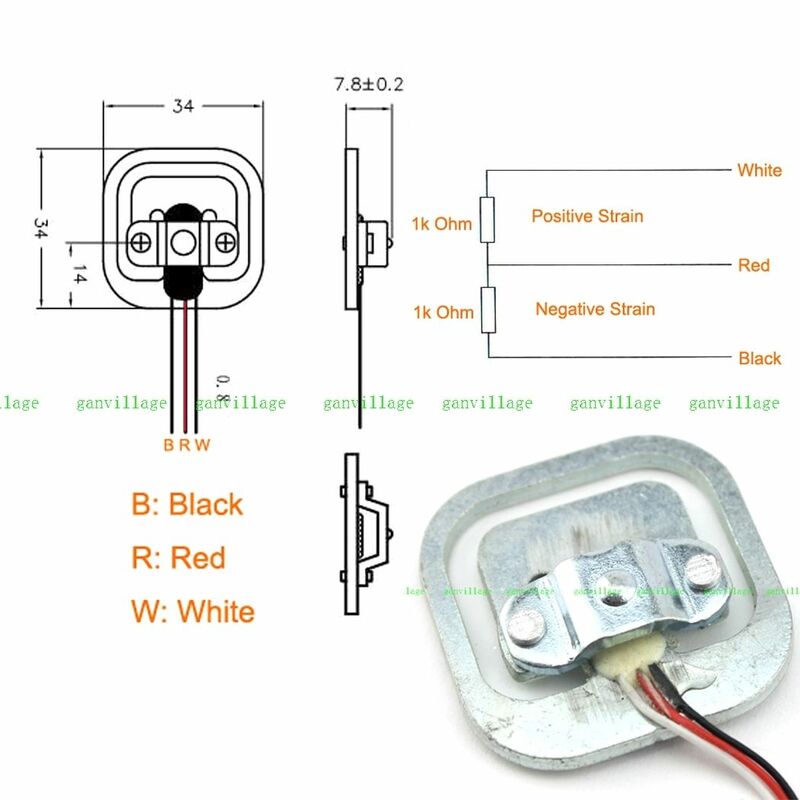 It seems like that module is used to connect the 4 wire load cell, but on the internet I found other schematics that might help you out how to wire it up. I am not an expert on load cells but it seems like you just need to give it a try and see if it works. How can i connect a load cell with three wires to the amplifier? it is one-side of the bridge. the other side can be another load cell or a resistor bridge. When you have four half bridges I think that you will need to read them separately as pairs and then sum the result in software. I would be interested in hearing how multiple hx711 modules should be best handled by a Nano. Update. 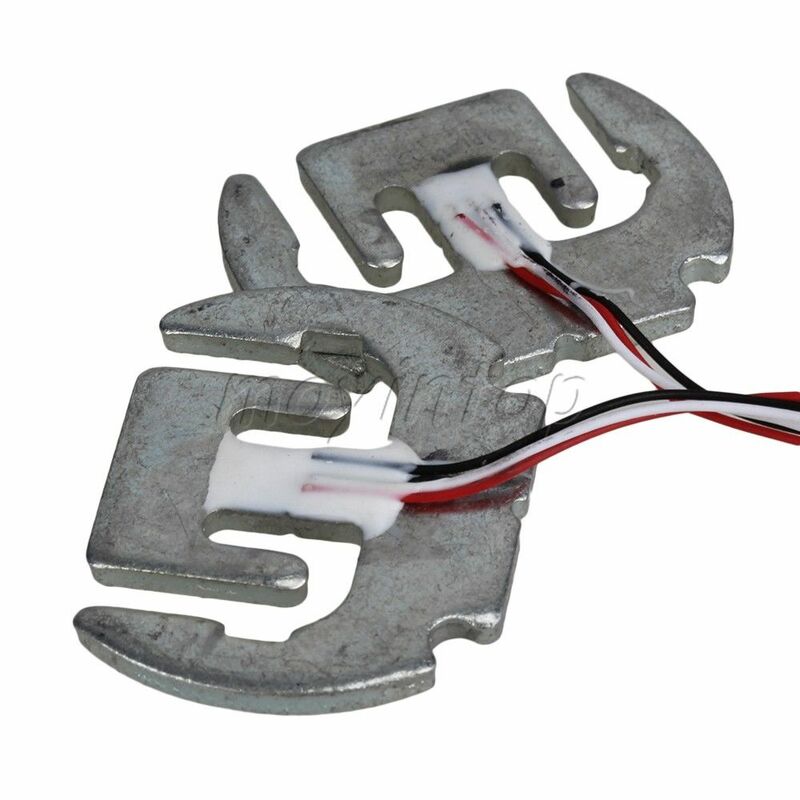 I have discovered that sparkfun produce a load cell combinator board that assists wiring four half bridge load cells to appear as a full bridge. I have still not understood how that works yet. Not the answer you're looking for? Browse other questions tagged arduino-mega c++ electricity analog-sampling or ask your own question. How do I connect two slaves of same type in I2C? HC-SR04 distance measuring without delay? Are pins 0 and 1 (Rx and Tx) parallel with the USB jack? Can I connect another USB jack th 0 and 1 and use it to upload sketches?